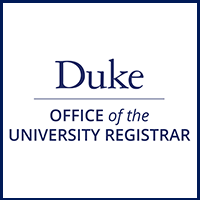 The Office of the University Registrar provides a variety of academic services to members of the Duke community. The office supports the overall educational goals of the university by providing critical components in the academic support structure. Learn more about our services, or request a transcript. For information on transcripts, including ordering, delivery, and processing information, visit our Transcripts page. Current students order transcripts via DukeHub. Those students who have graduated in the past year should also use DukeHub to order transcripts. For help, watch this video. Duke alumni and former students should order transcripts via the Transcript Request Form.